The Rocket bar will be screening Euro 2016 matches where possible, and as a special opening event we will have the bar open for Republic of Ireland vs Sweden at 5pm on Monday 13 June. The match will be screened live on the LCD screens in the Inner Courtyard (weather permitting), and in The Rocket. 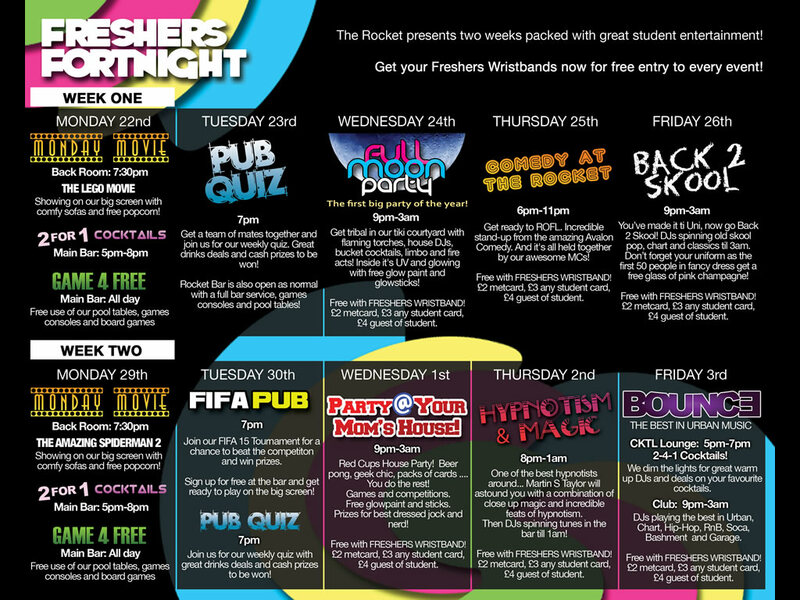 The bar will be open during the screening for students and staff so come down and unwind after work… there will be a free drink for the first 25 customers from 4.30pm and cheap deals thereafter. All 2pm weekday matches throughout the competition will be screened in The Rocket, with the bar open on other key occasions… depending on how England do! Casablanca’s Casino Night invites you for an evening filled with glamour, gaming and a gust of good old 1940’s speakeasy splendor adorned with classic cocktails and smooth Jazz sounds. This den of delights is for the well-dressed and well pressed go-lucky characters out for an evening of splendor on behalf of the children’s charity Barnado’s. Whilst listening to the sounds live music you can kick back relax or join the adrenaline junkies at one of four casino tables. Let your pulses run wild with roulette, try your hand at beating the dealer at our infamous blackjack table, or join the cool and calculated players at one of our poker tables. If the gaming is proving too exciting, refresh yourselves with our classic cocktail menu and let your taste buds experience the 1940’s forbidden fruits. If your taste buds are left tingling there will be a variety of delicious handmade cupcakes decorated with a twist . For those who like to shimmer and stand out from the crowd there will be a range of jewellery to browse and purchase from vintage and silverware designers to suit all tastes. For the successful players and tournament champions we have a host of prizes to suit all, as well as a raffle for those who just can’t get enough of the winning! 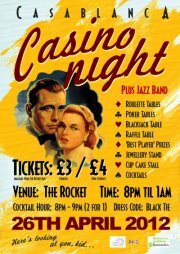 So come and join us at the Casablanca Casino Night – raising the odds and the cash for the children of the next generation.